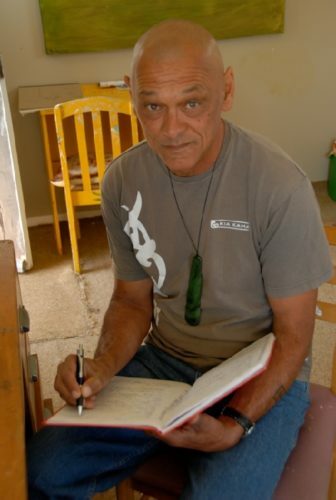 Apirana Taylor, of Ngāti Porou, Te Whānau a Apanui, Ngāti Ruanui, Te Ati Awa and Pākeha descent, has published several collections of poetry, short stories and novels. He has also published prolifically in other mediums including sound and video recordings. He writes for children and theatre, and is involved in acting, and teaching drama. Apirana is also a painter. Taylor’s first collection of poetry, “Eyes of the Ruru”, established his powerful voice among Maori writers and his prose, written predominantly in realist modes, firmly established his literary presence.